Home: Jewelry: Pendants & Necklaces: Anne Boleyn's 'B' Necklace - NEW! An exacting look at a reasonable price. 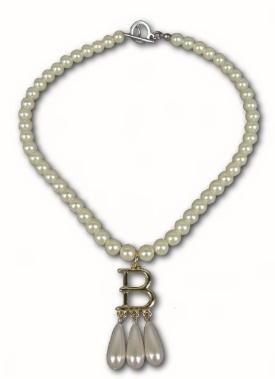 Our 16" faux pearl necklace features the famous "B" initial in gold metal, accented by 3 faux drop pearls. This is the style made famous by Henry VIII's second wife, Anne Boleyn, in several portraits.